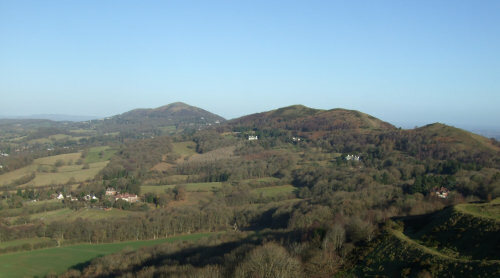 The Malvern Hills form the nine mile spine of the Malverns, with the town of Great Malvern on the north eastern flank, the village of West Malvern looking west across Herefordshire towards Wales, and Malvern Wells / Little Malvern nestled to the south east. With the twin peaks of the Worcestershire Beacon (1,395 feet) and Herefordshire Beacon to the north and south respectively, there are numerous walking and cycling trails taking in the views, wooded glades, village settlements and historical sites. The region was designated as an Area of Outstanding Natural Beauty in 1959, and the Malvern Hills Conservators now manage the 4,500 acres of hills and surrounding common land, keeping them accessible and well maintained. They also regularly publish a newsletter called The Beacon. Approximately 1 million people visit the Malvern Hills each year, although rarely are there any crowds to spoil the experience.